1. Preheat the oven to 160ºC, gas mark 3. Butter and line a deep 23cm spring-form tin, allowing the baking parchment to rise higher than the edge of the tin, if necessary, so you have a lined depth of approximately 10cm. Using a hand whisk, beat 400g of the butter and sugar together for 5 minutes until pale and fluffy. Add the eggs one at a time followed by the lemon zest and juice. 2. Sieve the flour into the bowl then, using a large metal spoon, fold the mixture together. Spoon into the tin and bake for 1¾–2 hours until golden and set and a skewer inserted into the centre comes out clean. Leave to cool for a few minutes then remove from the tin and transfer to a wire rack to cool completely. 3. Meanwhile, whisk together the remaining butter, icing sugar, vanilla and milk for 4–5 minutes until smooth. 4. If the cake has a domed top, remove it with a bread knife and turn the cake upside down. Using the same knife, cut the cake horizontally into three equal layers. 5. Spread the bottom and middle layers each with one quarter of the butter cream and two tablespoons of conserve. Stack the layers back together then spread the remaining butter cream over the sides and top of the cake. 6. Knead the white icing lightly then shape into a ball and, on a lightly dusted surface, roll out to make a round, large enough to cover the cake (try measuring the cake with a piece of string to use as a guide). Drape the icing over the cake, gently smooth the top and sides then trim any excess from the base. 7. Thinly roll out the red and blue icing and use a 3cm cutter to stamp out circles (a bottle top is ideal). 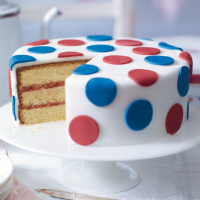 Dampen the polka dots with a little water and press all over the surface of the cake. Leave the cake to air dry for a few hours so the icing can harden. Once cut, consume within two to three days. This recipe was first published in May 2012.